This is becoming a must read series for me as I am more than taken with May Keaps, my heroine of the past. May is a gutsy young woman who has seen tragedies first hand during the first World War and now works as a Coroner’s Officer, in 1920’s London. The thing is, May isn’t a pen pusher, May is a hands on get her sleeves rolled up type of woman, that gives every dead person, that comes her way, as much peace and dignity as she can. 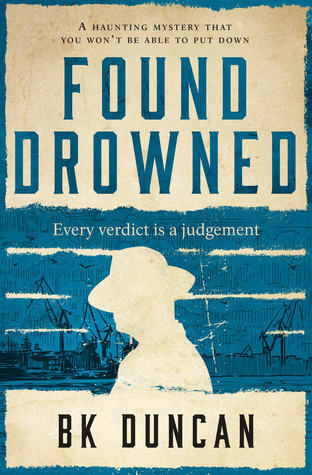 When the body of a young body is dragged out of the river Thames and signs of abuse become apparent, May is determined to find out who this child was and how he died in such terrible circumstances. It isn’t long before May is up to her neck asking questions in places that she is in danger of going to. She is like a kid poking a hornets nest with a stick and you just know that before long she is going to be running for her life. I just love not just the stories that BK Duncan creates but the whole package. The dialogue is just superb with phrases and accents flowing of the pages surrounding me and dragging me back in time. There are some hard pages to read of how things use to be back then, when a child could be turned out because the family just couldn’t afford to feed them. There wasn’t a lot to protect the vulnerable members in society. The more that May does in her job, the more she is becoming accepted for the talents she brings to her role, not her gender. It is lovely to see her get the respect that is due to her and demanded by her boss. Lovely bloke and the police are softening too. So looking forward to the next book in this series to see where May barges in next.